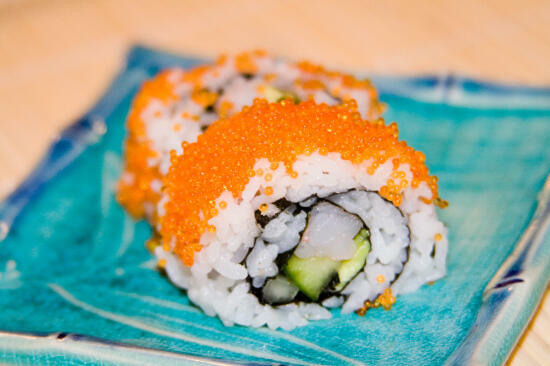 This roll is similar to the California Roll, using shrimp instead of imitation crab. 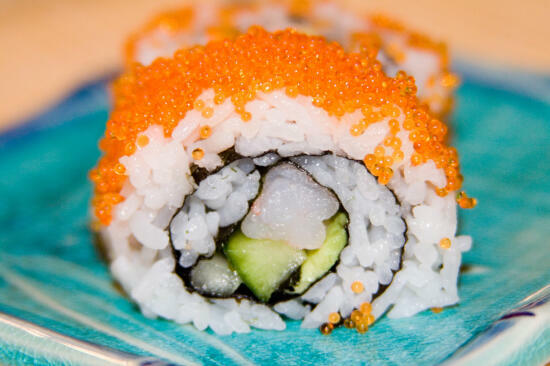 It’s really good, and the tobiko adds a nice splash of color to the roll. Look for your sushi ideas posted soon (I’m making them tomorrow! 🙂 ) Happy Holidays everyone!! I got this roll from the Sushi Chart. Slice the avocado and cucumber into long, thin slices. Roll the sushi inside-out, using avocado, cucumber, and shrimp as your fillings. Before cutting the sushi into pieces, spoon the masago over the sushi roll to coat (you can use more or less masago depending on your preference). Now cut the sushi into 6 or 8 pieces. Random question: where do you get your tobiko? Does it go bad quickly and is it something I really have to look for freshness? My sister served some the other day with king crab legs and I meant to ask her about that, but I forgot 🙂 Thanks! Yvo – I got the tobiko at Marukai, although I have also seen it at Mitsuwa. It’s probably best to try to use it within a few days of when you buy it… I’m not quite sure exactly how fresh it needs to be. Sorry! hien – No, it was tobiko… (that’s what it said on the package 🙂 ). Where I bought it I believe they also had masago and some of the green tobiko too… so I’m pretty sure it’s tobiko (unless they packaged it wrong!) About the exact ingredients in the Boston Roll, I really have no idea. If you do a search online, some results say it’s how I made it, some say it’s how you say, and some say something entirely different. Too many different variations. 🙁 So I have no idea! But I must say, your way sounds like it would be delicious! If you refridgerate tobiko it stays good like anything else in the fridge. I’ve used a two week old plastic cup of it out the back of my fridge and it still tasted good. Just make sure it’s sealed, or it won’t last. Wait… tobiko are the really small roe right? After reading the above confusion I too have it confused. The big ones don’t stay good as well. 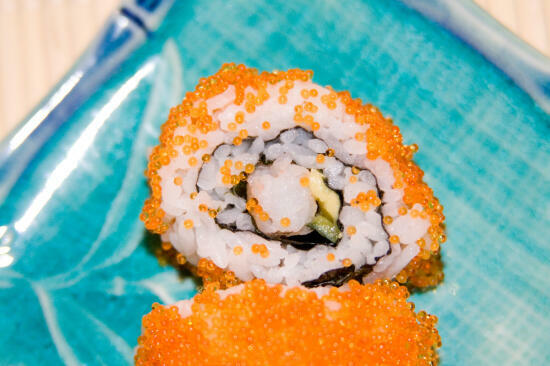 Masago, tobiko, let’s call the whole thing off. And for presentation, I don’t cut the tails off the shrimp, I peel the tails too! There’s actually soft meat inside the tail. Although it’s kind of hard to pull the flat little tail thingies off. Potentially time-consuming. I just think it looks cool to have shrimp tails poking up out of the last two pieces of the roll. And still be edible. ANYWAYS I really like this roll. Allison, you get a medal for sharing. I’m pretty sure tobiko are the small roe and masago are the larger ones, but I’m no fish egg authority so please nobody get mad at me if I’m wrong! best way to keep fish eggs is to freeze them. if you have large amount, divide them into small part then freeze it. Take it out about an hour before use because it defost very quick. Thank you for the helpful storage tips, and info on how long the roe could be kept. I purchased some (bulk) masago from an asian supermarket that they put into a smaller 1/2 lb package. I assume it was frozen but in the process of splitting it to a smaller package, it became slightly defrosted yet still cold over the course of 30 minutes. is it safe to “refreeze” it to use 4 days later? Yeah, I think it’s fine to refreeze it, and you should be able to use it up to four to six weeks thereafter. 🙂 Hope that helps! Thanks!! I will let you know how our sushi bash goes. Last year we rolled 1200 pieces. That’s awesome! Wow that’s a lot of sushi! Let me know how it goes! Micael – Glad you liked it! How do you get the tobiko to stick evenly on the rice? Mine has patches here and there like a badly maintained soccer field. On a sushi roll with deep-fry shrimp, you won’t hear the overpower fishy smell. … A fully cooked delicious sushi roll made out of poaching shrimp, avocado and cucumber.